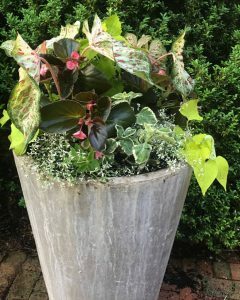 Mondays are the best days to put a few container combinations together before the weekly orders begin to come in for custom plantings, arrangements for parties, and the general hectic pace of spring continues. 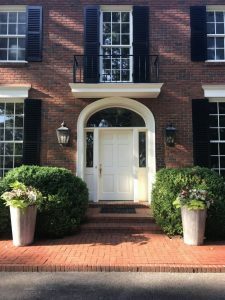 The goal is to give inspiration to all of you who might be overwhelmed with the choices available or want something to take home and plop by your front door, on your porch, or in the garden. This past weekend it was fun to talk with some ladies, two sisters and their mother, visiting from Columbus, Georgia. 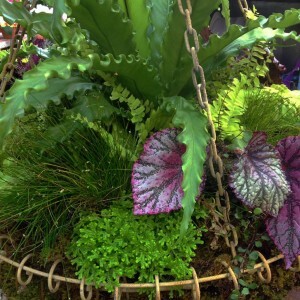 While the sisters browsed through the greenhouse, their mother was busily amassing quite a collection of plants to carry back with them, an alarming amount in the sisters eyes. “How are you planning to fit all this in the car.”, one of the daughters asked. “Oh, it will be fine.”, Mom said airily. “We’ll just shift some of the luggage around.” It was such fun talking with her, answering questions about the plants she saw on her own or in various container combinations throughout the nursery and greenhouse. I’m not sure exactly how they eventually managed to get all the plants in their car for the trip home, but I do know Mom would have packed the plants and shipped the luggage if it came down to it! 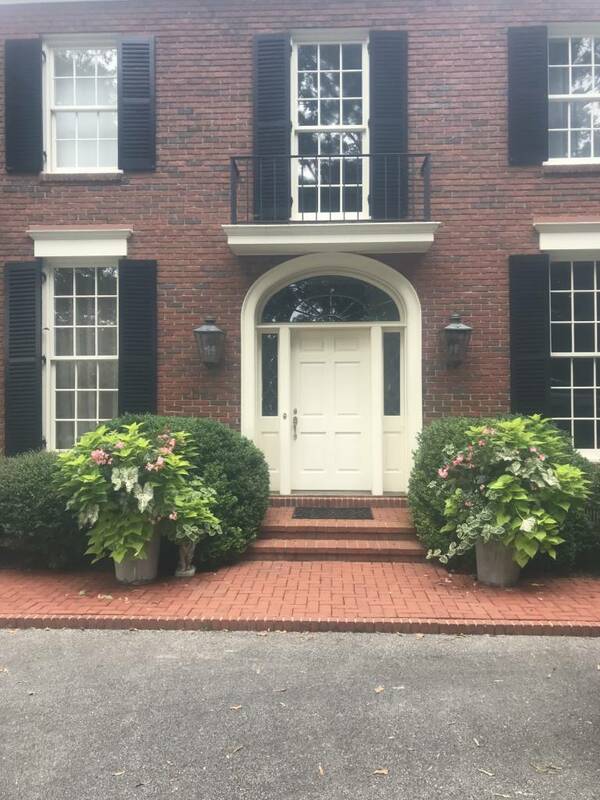 Some of the plantings our Georgia visitors saw are shown in this post and include foliage plants for filtered sun to shade, including coleus, the largest of which are the Kong series, big bold beauties for shade. 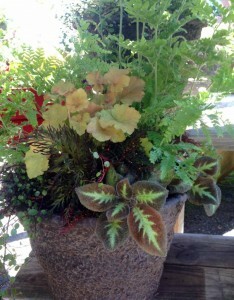 Don’t forget caladiums, always a stalwart…and many now also tolerate full sun. 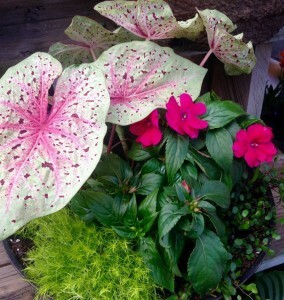 Hypoestes, or polka dot plant, comes in pink, white, or red, and Rex begonias have beautiful patterns and colors too. 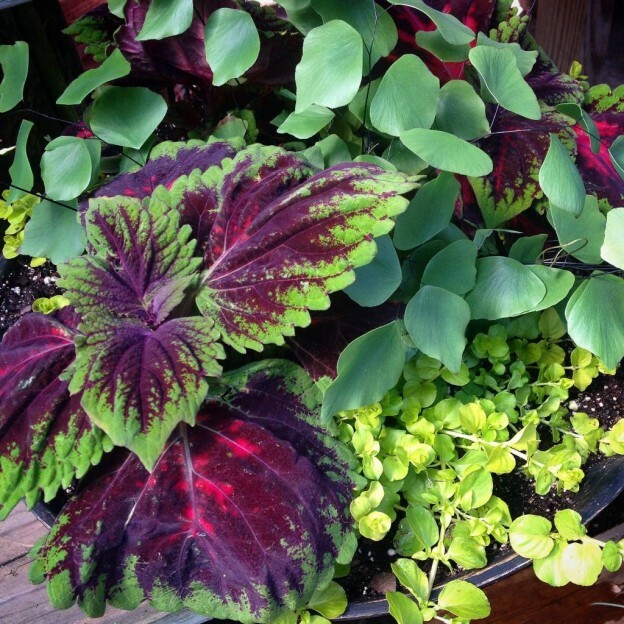 A trailing golden creeping Jenny or variegated creeping fig adds either gold or green and white coloring. Episcias are another beautiful choice when they’re available. Use bloomers like the new Bounce series of impatiens, SunPatiens, Torenia (both trailing and upright), Babywing or Dragonwing begonias, and airy white euphorbia for even more color. 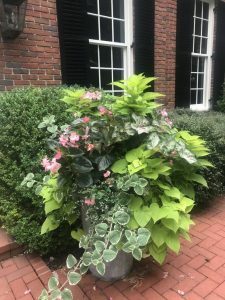 Using interesting foliage with flowers in plantings that don’t get the hot summer sun (and those that do) is always the goal for an interesting and vibrant composition. And, as plant choices change through the season, you’ll see different planting combinations on any given week as new plants become available and others are sold out. 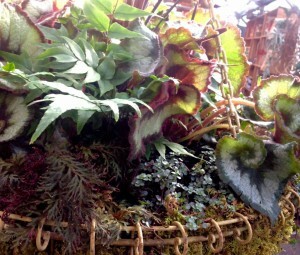 This changing inventory may call for creative substitutions for some plants, but that also makes it fun! 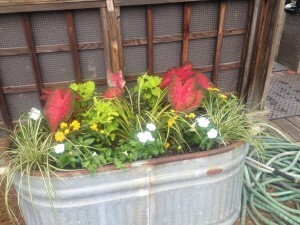 This entry was posted in Annuals, Bedding Plants, Container, Container Gardening, Ferns, Flowers and tagged color with foliage, container gardening for shade, foliage combinations, summer container gardens on May 10, 2015 by Kris Blevons. The other day I noticed we only had two midsize, light-weight brown planter bowls left in stock, and they were just calling to be planted. 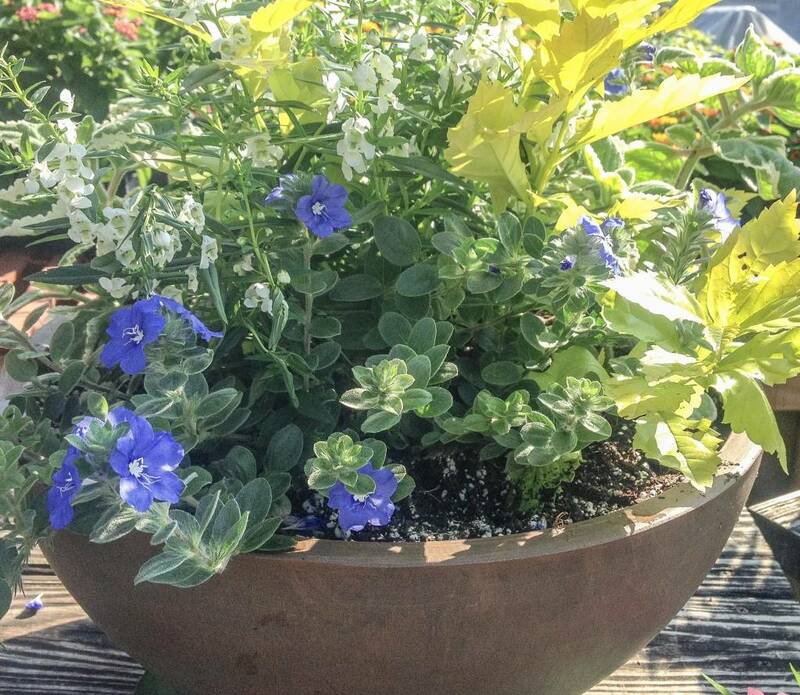 Since summer is relatively slow and we have time on our hands, we’ve been planting all sorts of mixed containers with annuals, herbs, perennials, and everything in between to tempt folks coming in; and I thought one of these might be just the right size for someone. 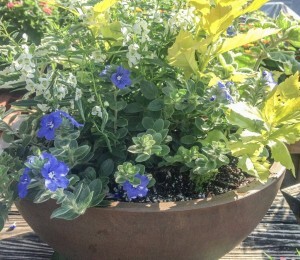 Usually if I plant two of something for display, I make them similar, but, with these, I decided to play off the brown color of the bowls with two different plantings – both for sun, but each quite different, using annuals. Here’s what I came up with. 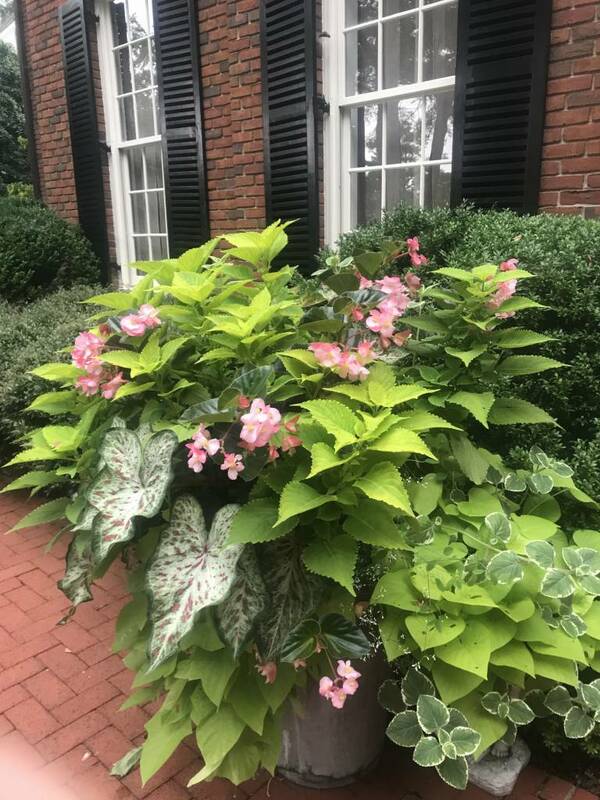 Of course, there are endless variations of plants out there; these are simply my two versions using annuals available mid-summer. 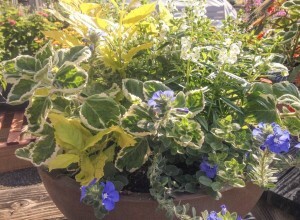 The first planting uses light colors that are quite harmonious – white, blue and yellow. 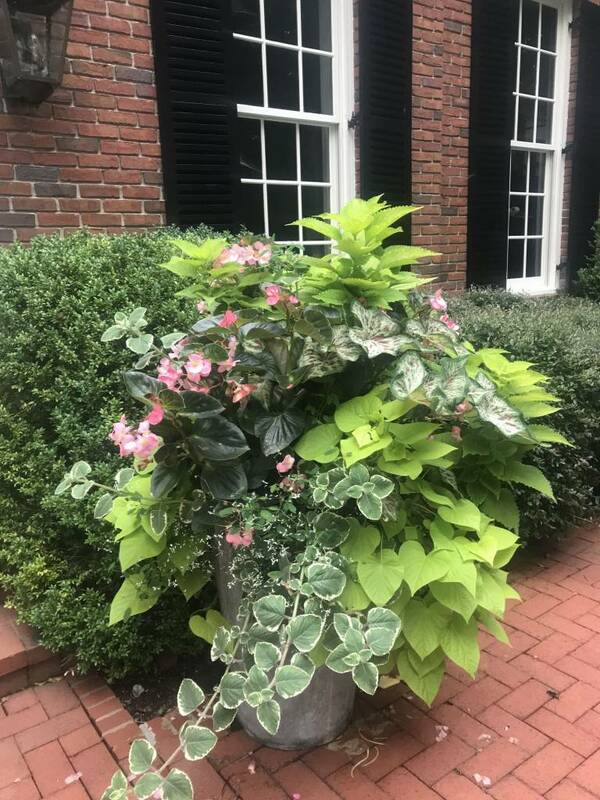 A variegated Swedish ivy and yellow duranta are the all-important foliage accents here, and the white flowers of the angelonia will add a spiky bloom in the center (The yellow duranta will need some clipping eventually to keep it at the right proportion for this planting.). Pretty blooms of a blue daze trailing over the edge complete the picture. 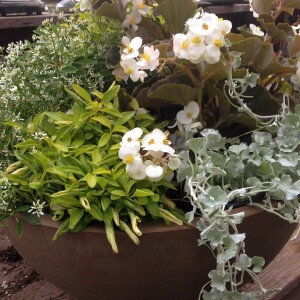 If the container were larger, I might have added a silver thyme as well. Color is an interesting thing. You can either go big, bold, and wild and mix many together, or you might choose two or three very opposite colors (Think purple and orange, for example.). 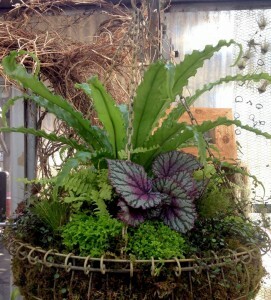 Combinations can also be fairly calm, using colors closely related. Flowers obviously add color to any composition, but don’t forget the importance of foliage too. 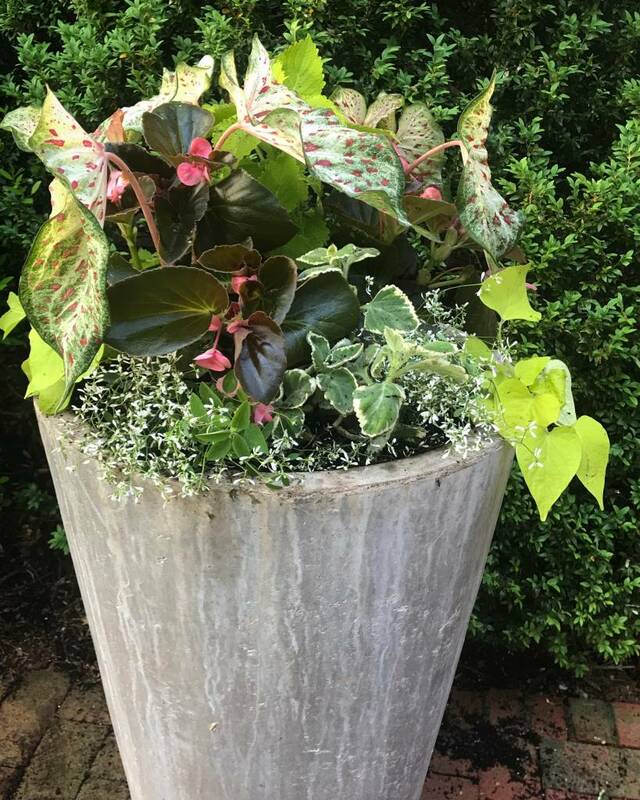 Many times I’ll begin a design by pulling foliage plants to accent a particular planter, then add blooming plants to play off of those leaves. 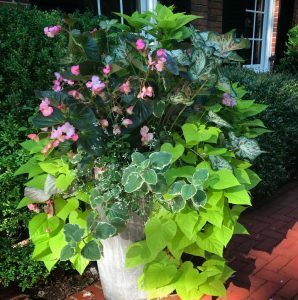 In fact, leaves and their shapes are extremely important to the overall look of a planter once it’s completed and growing out. The second is quite different, though once again there’s a yellow foliage (Yellow works so well with brown! 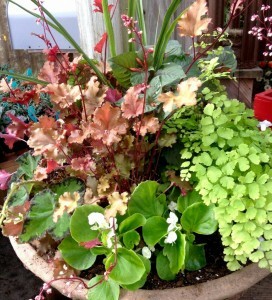 ), this time a dwarf Joseph’s coat, and white blooms too, represented here by a dark leaved baby wing begonia. Its leaves match the color of the bowl almost perfectly. 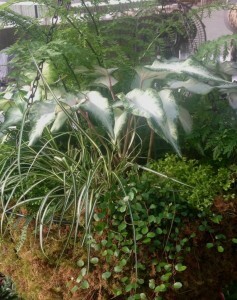 The begonia is a heavy presence in this planting; so, to lighten it up, an airy blooming white euphorbia went in next. Finally, the silvery foliage of a trailing dichondra spills over the edge, adding a nice contrast to the brown of the pot. So, there are now two fairly simple, yet quite dissimilar plantings in the same bowl. 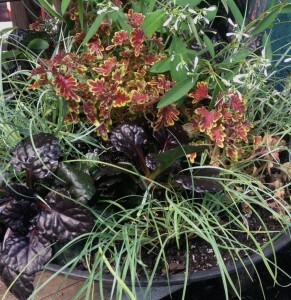 At another time of the year, the choices would have been even more different…yet another reason container gardening is so entertaining! 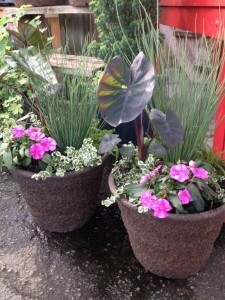 Stop in and take a look at our container planting designs if you’re in the Birmingham area. We try to have as many made up as possible to give you ideas and inspiration! 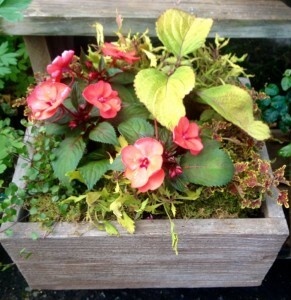 This entry was posted in Annuals, Container, Container Gardening, Flowers, Planting Tips, Summer and tagged annuals in containers, color in containers, container combos, container gardening, containers with mixed flowers, flowers in containers, lightweight planters, plantings in brown bowls, summer container gardens on August 2, 2014 by Kris Blevons.